Be Social, Relax & Create! Experience not necessary. Enjoy a creative session of wine tasting, appetizers and guided steps to create a beautiful painting. All materials provided to complete a 16" x 20" matted watercolor painting. View this video to see the fun you and your friends can have! Saturday July 20th, 3-5:30pm Palouse Winery on Vashon Island. Sponsored by the the - Washington Athletic Club's Wine Club (WAC-WIC?) 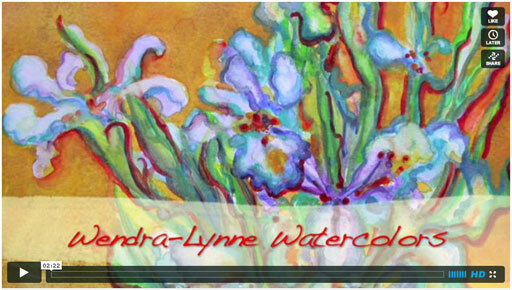 this special Wine and Watercolor with Wendra social event is open to the public. Come by after Strawberry Festival and cool off with your friends at this fun, creative participatory event! No experience necessary, $45 includes wine, appetizers, and all materials to complete a beautiful matted painting. Click below to reserve your space. 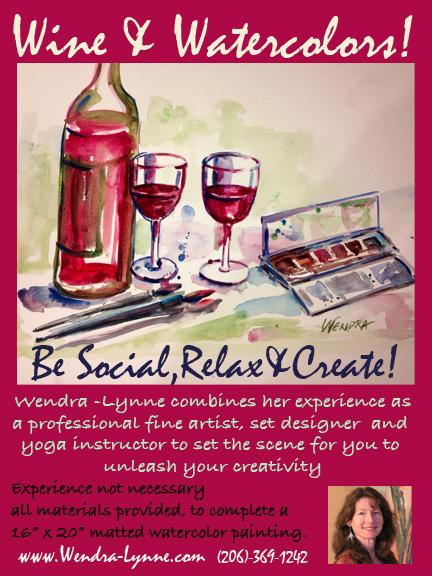 Contact Wendra to plan your own private or corporate event.